Modeling Career? I don’t think so! 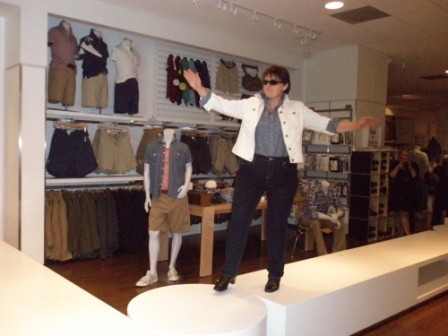 Weight Watchers and the Gap held a fashion show at the Perimeter Mall store this week and I was invited to model, along with a few other women from the Dunwoody meetings. Girls just want to have fun: It was a blast! I got to try on almost everything in the store. There was a fashion consultant to help me put together three “looks”. One professional, one casual and one girl’s night out look. Then Sephora makeup artists worked their magic. I’m not invisible anymore. Unlike some of the other models, I strutted my stuff and had fun on the catwalk. It felt great to show off and have people look at me. I’ve felt invisible most of my life. As if I was hiding behind my wall of fat. Papparazi effect was great – lots of people with camera’s including my son and husband. My son is so proud of me that he corrected the announcer when she said I was wearing a size 12. He said “Actually, she can wear a size 10, but its a little tight.” Is he wonderful or what? What size am I? Shopping afterwards would have been fun, but we’re dead broke right now. Plus, I’m still trying to lose and reduce the size of my stomach so I have no idea what size I’m going to end up. Right now the 14’s are starting to get a little lose and since that was my target size, I have stopped guessing and I’m just going to see where I end up. 12’s are starting to fit and one size 10 dress that MIGHT have been mislabeled! It was hard to find something that made me feel professional. I think of professional as jackets, suits – but the sweater with a belt worked well and hey – those are a size 12 pant! Iwas the only one who went with color instead of black for the Night Out look. and funky hoop earrings and black boots with heels. This entry was posted in 4. Success and tagged Gastric Bypass, GBS, losing weight, RNY, Weight loss, WLS. Bookmark the permalink. The Project Manager’s Guide to …. Everything!